Fluorescence spectroscopy is an effective method to obtain a physical or chemical signature for delineating the composition and characteristics of organic matter. It is a major tool for analyzing food security. However, since most organic ingredients have similar fluorescent spectra, it is difficult to distinguish them with high precision by traditional fluorescence analysis. PhD Mu, considering the time characters of the fluorescent spectra, develops a new method based on time-resolved fluorescence. The time resolution is 3 ns realized by a TRiCAM: a gated, intensified CCD camera by Lambert Instruments. The contour diagrams of the time-resolved fluorescence intensities (CDTRFIs) of different kinds of edible oils are acquired. Outperforming traditional fluorescence analysis, CDTRFIs greatly improve the identification capabilities without sacrificing the advantages of traditional fluorescence analysis. Figure 1. Different shapes of the LIF spectra of the rapeseed oil. The shapes of the laser-induced fluorescence (LIF) spectra of the edible oils change over time. Figure 1 shows an example of such a variation in the fluorescence spectral shapes of rapeseed oil. In this example, the gate width (GW) is fixed at 3 ns, and the time gates (TGs) were at 3, 13, 23, 33, and 43 ns. Given the various fluorescence lifetimes of the excited aromatic compounds, the fluorescence spectrum of edible oils varies at different time windows. This variation explains why the shapes of the fluorescence spectrum vary over time. These changes in the spectra vary depending on the oil type and can be conveniently used to distinguish different oil types. Contour diagrams using fluorescence wavelength and TGs as axes are used to show the changes in LIF shapes over time. Figure 2 shows contour diagrams constructed this way when all the spectra are normalized and only one excitation wavelength (355 nm) is used . The vertical axis of the CDTRFIs has wavelengths ranging from 390 nm to 720 nm. In addition, the time range along the horizontal axis is 45 ns, with a 3 ns sampling interval. Then fluorescence should be measured at 15 different TGs for each oil to construct an intact CDTRFI. Figure 2. Contour diagrams of normalized time-resolved fluorescence intensities of (a) olive, (b) rapeseed, (c) grapeseed, (d) soybean, (e) corn, (f) peanut 1, (g) peanut 2, and (h) peanut 3 oils. The fluorescence wavelength (y-axis) and detection time (x-axis) are used as axes. The wavelength is 390 nm to 720 nm, and the time range is 45 ns with an excitation wavelength of 355 nm. The gate width of the TRiCAM is set to 3 ns. In summary, LIF shapes strongly rely on TGs (Figure 2) , thus providing a new approach for discriminating different oils. CDTRFIs are proposed to improve the identification capabilities compared with LIF and the classification speed compared with total luminescence spectroscopy. Outperforming the steady-state fluorescence approach, the proposed approach facilitates the analysis and discrimination of edible oils. The feasibility and reliability of the method are demonstrated by analyzing peanut oils of three brands in a supplementation trial. The method may be further improved by reducing the GW of the ICCD and the laser duration and by using smaller increments in the contour diagrams. Created to provide unique fingerprints for edible oils, this technology provides food security researchers with a rapid and reliable means of analyzing and classifying edible oils. Graphs courtesy of Taotao Mu, School of Optoelectronics, Beijing Institute of Technology. 1. 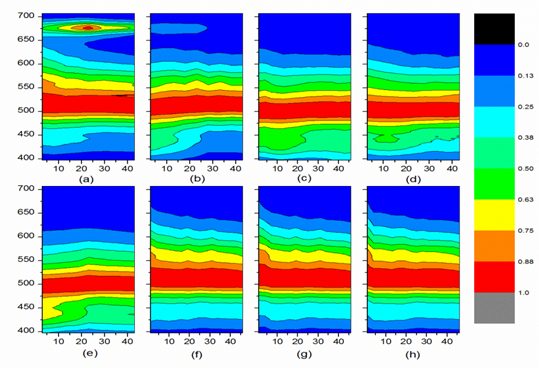 Mu TT, Chen SY, Zhang YC, Chen H, Guo P (2014) Characterization of edible oils using time-resolved fluorescence. Analytical Methods 6: 940-943.